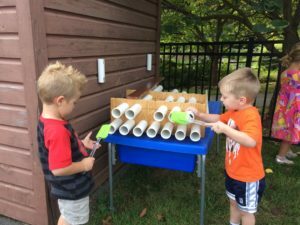 The Children’s Corner offers a unique experience and setting because we are located in the Retirement Community of Moravian Manor allowing children and residents alike to engage in mutually enjoyed activities. One of our gardens was designed in loving memory of a resident that volunteered her time and gave us a great appreciation of her love for nature and the outdoors. We have an inviting campus that allows us a great deal of exploration. 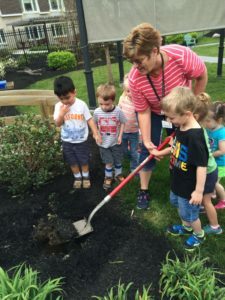 Gardens and wooded paths surround us and our classrooms are connected by an aesthetically pleasing patio where children can appreciate the natural beauty of the outdoors. 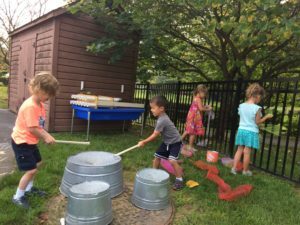 Children are encouraged to experiment, explore, and pursue their own interests and are given choices and a role in determining how they will learn. Children have an innate power that comes with being surrounded by possibilities, the freedom of active play, and feeling good about their environment. 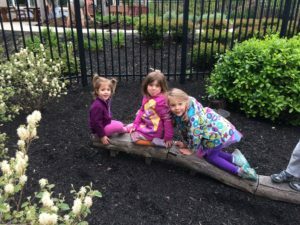 The preschool and toddler classrooms at the Children’s Corner exit onto a spacious courtyard surrounded by boulders, serviceberry trees and dogwoods. A trellised arbor leads up a footpath to a gazebo used to gather for story time and other activities. Birdfeeders and shade trees are natural homes to wildlife. The hillside contains a slide, climbing steps and a boulder wall that is home to chipmunks. Fragrant herbs line the path that leads to the play areas. A gate leads into a fenced playground designed for the infants and toddlers. 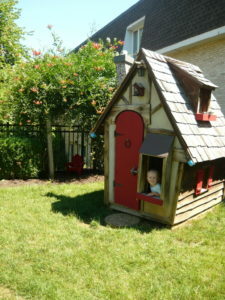 The playscape features an enchanted cottage to enrich play and learning. A soft fall mat houses a climbing unit with a slide and a fire truck. An Asian inspired meditation garden provides a natural shade area for reading, digging and exploring all that nature has to offer. A turtle sensory garden will be added to this unique space in the spring. The preschool playground is fenced and looks out to a large meadow used for large motor games and activities. The meadow is encircled by a path that meanders through the woods. Several gates lead into the playground. A large mulched area in the center is home to a cedar jungle gym with swings, a climbing wall and two lookout towers as well as a slide. A large sand pit is home to hours of castle building, construction with trucks and diggers and many hidden treasures can be found beneath the warmth of the sand. A bike path circles the playscape and children are enticed to explore play areas throughout the playground. A boat was donated as a unique area to sit back and relax or use the fishing poles to reel in a big one! Residents at Moravian Manor lovingly constructed a small scale arbor to crawl, walk or spend some cozy time in. 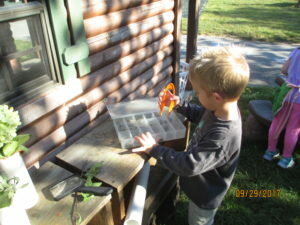 A raised garden bed is used to grow produce for summer snacks and cooking projects. A hill was constructed that features ropes and tires for climbing and a slide for a fast exit down the mountain. Fairies reside in a container and metal drums and other instruments are used to make a joyful sound. 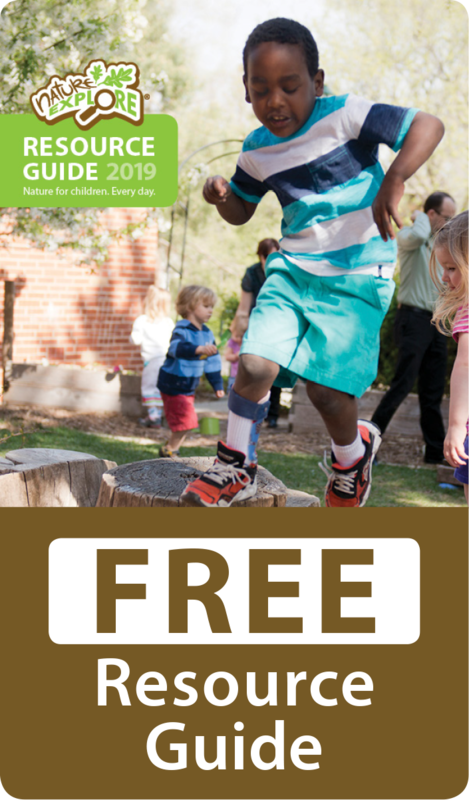 The playscapes at Moravian Manor are enjoyed by the children and host family picnics, festivities with the residents and visitors are welcome to explore, play and learn.